Somali pirates hijacked Yacht Tanit on April 04 and took the crew as hostage off the coast of Ras Hafun, northeast Somalia. The French couple in the yacht are bloggers as well. On April 10, the French troops successfully released the yacht. The yacht had sailed out from Vannes on France’s Atlantic coast in July 2008, en route to the Indian Ocean archipelago of Zanzibar. The 42-foot yacht is flush-decked Colin Archer cutter. 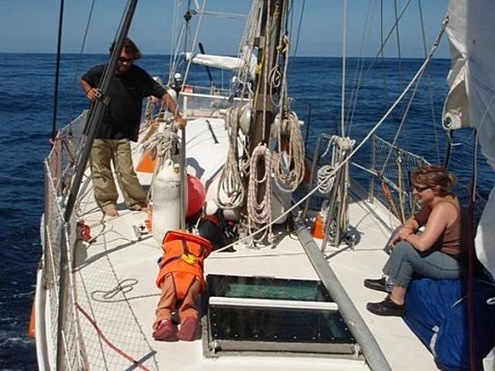 The yacht is having a young French couple Chloe, Florent Lemacon and their three year old son Colin. Later one more couple joined the yacht. The crew of yacht were warned in March, by the French surveillance ship, the Floreal regarding the dangers of sailing through Somali waters. Despite warnings by the French Navy, the Yacht Tanit was hijacked by Somali pirates on April 04. After the hijacking, the French defense ministry closely monitored the movement of the hijacked yacht. On April 10, the French troops stormed the yacht and successfully released the yacht from Somali pirates. During this rescue operation, unfortunately a hostage was killed and four others, including a child, were freed. Two pirates were killed and three pirates were captured. 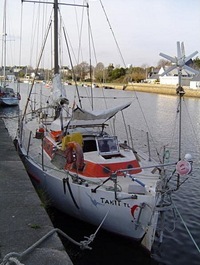 Here is a photograph of Yacht Tanit, with the French couple. The above photographs are from their blog. For more information and photographs on Tanit, log on to Le voyage de Tanit. Read more from France 24: News Report1 and News Report2. The rescue operation lasted for six minutes. French navy commandos succeeded in freeing Chloe Lemaçon and her young son Colin, as well as the friends who were travelling with them. Florent Lemaçon, the Captain of the vessel was held alone in the centre of the ship. He was injured seriously and died, although it is unclear whether he was executed by pirates or caught in crossfire. Read more and view video clip from France 24. Also view another video clip here. Four freed hostages, including the widow and three-year-old son of the French skipper killed in a special forces shootout with Somali pirates reached Paris on April 12 on a French-chartered aircraft. Read more and view video clip from France 24. Three captured pirates (aged 23 to 27) by French forces are being tried in France. They face a maximum sentence of life imprisonment. Read more from France 24. The autopsy on Florent Lemacon, skipper of the yacht Tanit who died during the rescue operation, has not yielded any information as to the origin of the bullet that killed him. Read more from France 24. As per Europe 1 radio, the skipper Florent Lemacon was shot and killed by French special forces accidentally during the rescue operation and not by his captors. Read more from France 24.